So, let’s take this from the beginning. The gist of the problems is, surprise, Internet Explorer (yeah, I know, it’s a shocker…). There is a W3C standardized event handling model that Microsoft doesn’t abide to, but they instead have created their own model (this is one of times I almost resort to actually supporting Dvorak’s The Great Microsoft Blunder, but that’s really a rant for another day…). 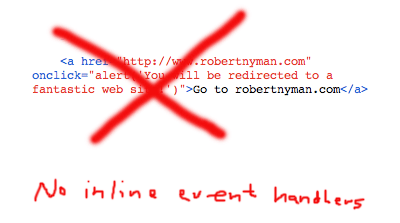 First, you never want to apply event handlers inline. Period. Second, normally you might want to apply several event handlers to the same event on an element without knowing (or needing to know) if there has already been assigned any, and also without overwriting any potential existing event handlers. The solution for this was presented as far back as in 2001 by Scott Andrew LePera in his Crossbrowser DOM Scripting: Event Handlers, which uses the standard addEventListener method for web browsers who support it, and has a fallback for IE by using its proprietary attachEvent method. So far, so good. The problem with Scott’s method, though, is that for IE you can’t use the this keyword in the function that receives the event. Normally, using the this keyword in a function regarding to an event should refer to the element the event occurred on. Unfortunately, in IE, it refers to the window object instead when using the attachEvent method. This is most likely due to IE only having one global event object, as opposed to the standard model where events are local and passed with the function call (for a more detailed write-up, read Peter-Paul Koch’s Advanced event registration models article, and for a more real-life scenario, read his addEvent() considered harmful; both good reads). It supports, naturally, multiple event handlers. It supports the this keyword. It allows for cancellation of default event behavior. It easily allows for making a script to see what event handlers are registered to an element. You can specify in what order event handlers should run. However, it unfortunately lacks a way to specify capturing phase. I’m going to be honest here and admit that I, due to lack of time, haven’t tested Aaron’s solution extensively, but I thought it was an interesting angle to the solution, and from what I’ve seen so far, it looks very clever too. Therefore, I encourage you to take a look it, test it and read the explanation to his approach. Please give him feedback and comments so he can find any eventual flaws. There's one advantage of using inline event handlers.. is that they're avaliable right when element appeared in DOM tree. Going other way you can assign event after all page is loaded or you need to use other combined way to get it faster.. It might be issue with large pages (that has content loaded partially). Essentially, what I want boils down to 3 things: your opinion of the design itself, testing of browsers I can’t test, and testing of performance. Please, email me (two.a.ron [at] gmail [dot] com), or post comments on the explanation page. Honestly, why does support for capturing matter? So far as I know, Opera is the only modern browser that supports it. A big problem with the original <code>addEvent</code> (so far as there is an original) was that it included the capturing argument as a passthrough to the third argument of <code>addEventListener</code>–many people set it to true, and this resulted in inconsistencies between Firefox (which will pretend that capturing is false) and Opera caused confusion. And, of course, Internet Explorer doesn't even pretend to support capturing. Because of all of this, I can't see how capturing support can be included in a general event-handling solution. If you need capturing–and I can't think of why you would (any ideas? )–you should deal with cross-browser inconsistencies yourself. They're impossible to abstract. As far as I know, Gecko-based web browsers have supported capturing for a long time too. But I agree with you. If you want to handle events consistently across web browsers, playing around with capturing isn't that interesting. this assumes you only have one window and will only work if one attaches events to the same window containing the script. If one needs to attach events to other dynamically created windows or iframes that will not work. Also, see the latest Dean Edwards addEvent() source to see how this line has been modified to fit his code. Interesting. You're absolutley right. I never work in environments with frames so it didn't occurr to me. those who will provide sufficient answer will be greatly appriciated. To my knowledge, when the <code>onunload</code> event occurs, it's not possible to tell if the window has actually been closed or just reloaded. listener: The function that will handle the event. useCapture: I'm not sure what this is, but according to w3 is states that if the user wishes to initiate capture. Yes, it's mentioned in the post. The problem lies with IE and its own event handling, and how to get around that. Hmm there was someone that had posted before me asking how to create events in firefox, that's why I have posted that. But I guess it got deleted. There is a similar question/discussion on this Stack Overflow coders community for whoever could be ineterested.